1895 Pennington - Paul BrodieFlashback Fabrications Ltd.
Mr. Edward Joel Pennington appeared on the streets of Milwaukee in 1896 with his “Motor Cycle”, the first two wheeled gasoline powered machine in North America. Contemporary reports said it did 35 mph, 60 mph, and one journalist doubted it ran at all. It was ridden down Grand Avenue, within one block of where two 14-year-old boys named Bill Harley and Arthur Davidson lived as neighbors. No doubt they witnessed the demonstration and were inspired. Pennington coined the term motorcycle, invented the first spark ignition, and also the balloon tire, all of which appeared on this machine. Pennington was also one of the most colorful characters in motorcycle history, and a con man extraordinaire. 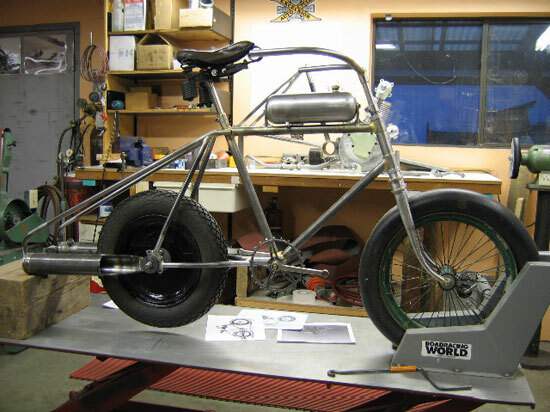 He demonstrated the bike at various locations, attracting investors, and produced no further machines. He left for England, where he began another company, and bilked UK investors of 100,000 pounds. Pennington and the motorcycle disappeared over a century ago, until the original drawings, and period photos were discovered in England by P. Gagan. 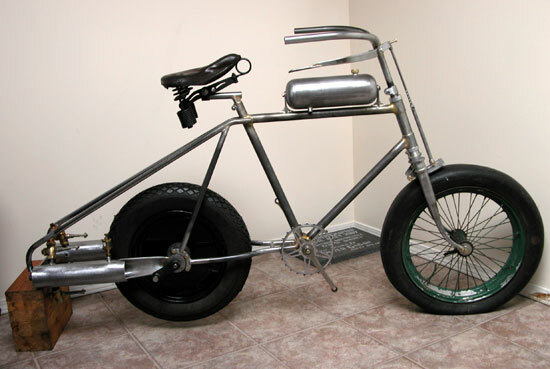 The frame and forks were built by Paul Brodie of Flashback Fabrications while Gagan built the engine. Did the Pennington actually run? How fast did it really go? We will find out. 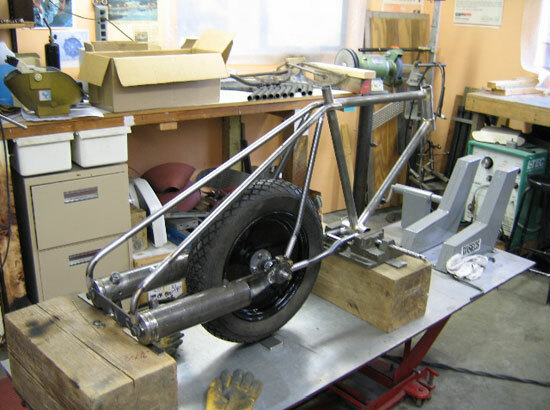 In the picture below is an example of “free form” frame building. I have a full scale drawing of the Pennington nearby, and check often to see if dimensions are correct before adding more tubes and tack welds. Note the metal shims used to get the heights right. Rear seat stays and engine supports have been added. 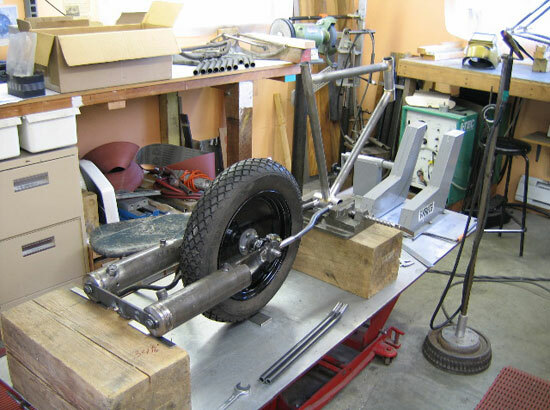 So you know what’s going on, the two big tubes behind the rear wheel are the cylinders, the rear wheel is the flywheel, and the axle will have struts added to become the crankshaft. Displacement is 1000cc. One downside of this design is that it’s too easy to get dirt into the cylinders. The bicycle influence is very evident in the front forks. All brazing was done with a nickel-silver rod. 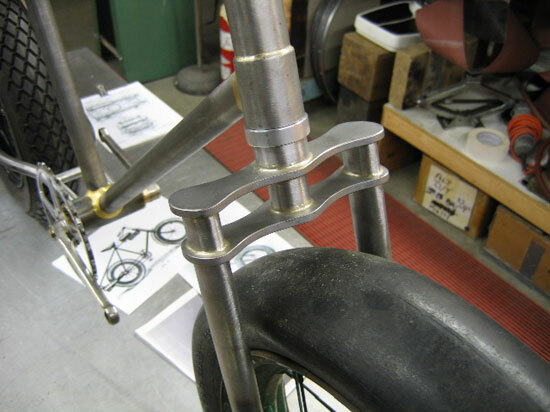 The bottom bracket was fillet brazed with a nickel-bronze rod. It’s not as strong as nickel-silver, but you can put more on because it has better flow characteristics. All early hand-built mountain bikes were done like this. For the Pennington, it’s a good way to imitate a casting, when painted. 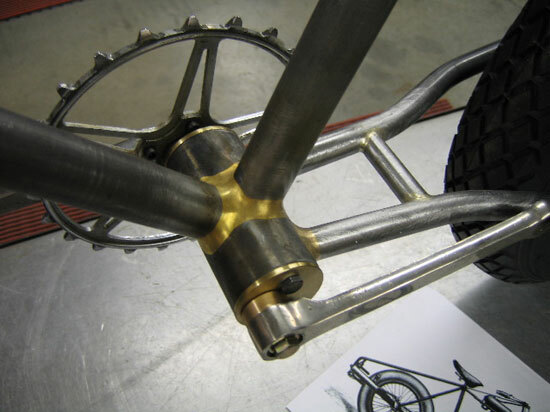 The eccentrics were machined from bronze, so they are also the bearing material for the pedal crank axle. 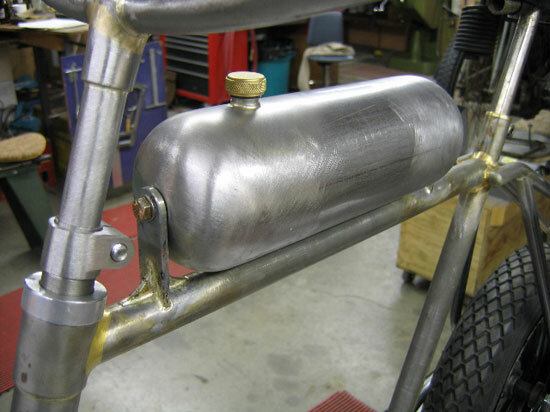 The gas tank is constructed with machined end-caps welded onto a large diameter tube, then sanded smooth. On the left is the handlebar stem, another “casting”. Front wheel is from a WW2 mail plane. Check out the radial spoking, bike still needs the front spoon brake for safety. It’s coming together. Spoon brake is operational. Some of the engine valves and sparking apparatus are evident, and the cylinders have been prepped for nickel plating.